You guys have been asking for some sweet wall art, and we’re here to deliver! We’ve got four amazing and super easy ways to spice up your walls. Start by grabbing a mirror from the thrift store. We don’t want our mirror to have a frame to create a nice clean effect, so we’re going to remove our frame. Next, we picked up some white fringe from the fabric store! Time to add it to our mirror. With the mirrored side facing down, start by laying the fringe across and cut it to the length of the mirror. Do this twice so that you have two pieces of fringe. We did this to double up on the thickness of the fringe. Repeat this again, cutting two pieces that are a couple inches shorter than the first pieces. Do this, yet again, with two pieces a couple inches shorter than the second pieces. Our fringe is pretty long, so we’re laying the first strip a few inches above the bottom of the mirror and hot glueing it in place. Add the second longest piece directly on top of the first. For the next row, we are going to start by glueing the two second shortest pieces together. Lay this glued piece on top of the first row and figure out how long you want it to hang. Next pull a few strings from the bottom layer and pull them up towards the back of the mirror. The more strands you do, the more even your fringe will hang. 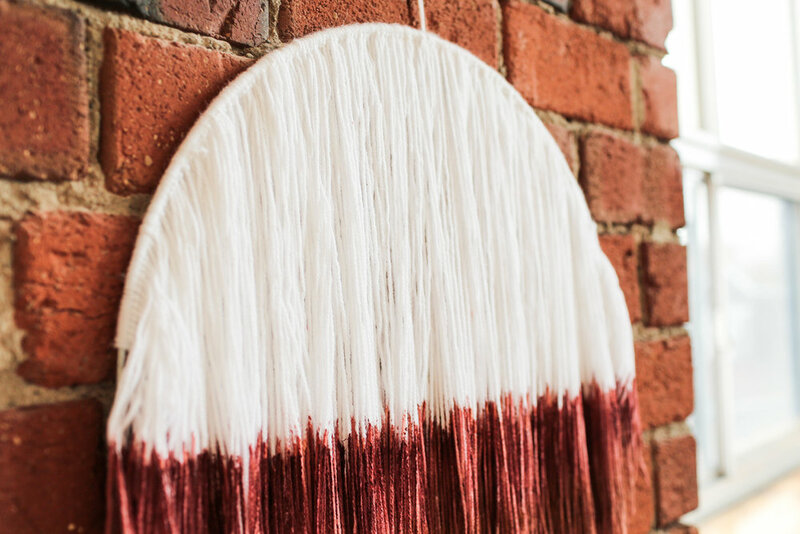 Glue these strands to the band of the first row of fringe. Repeat this whole process for the third and final row of fringe. Since we took the mirror out of the frame, you’re going to need to add some mirror clips! You can find them at the hardware store (we’ve also linked them here!). Hang, style, and you’re done! This is a great way to take an old picture and turn it into something new! We always see weird and funny art at the thrift store, and we thought we’d pick some up and upcycle it! We started by removing the thrifted art that we picked up out of the frame that it came in. We then placed a piece of parchment or tracing paper over the area that we want to protect, traced around the shape, and cut it out. Use more tape to tape that shape in place over the area. Use a paint brush and white acrylic paint to add a quote! Paint over the parchment paper to create the illusion that the words are behind the image! Another way to upcycle an old thrift store picture is by doing the opposite of what we did above, and paint over the main subject of the photo with a bold or different colour. With this deer photo, we painted over some of the main elements of the photo using some gold leaf paint (you can get some gold leaf paint here). We think this would look awesome with a bright pop of colour as well! 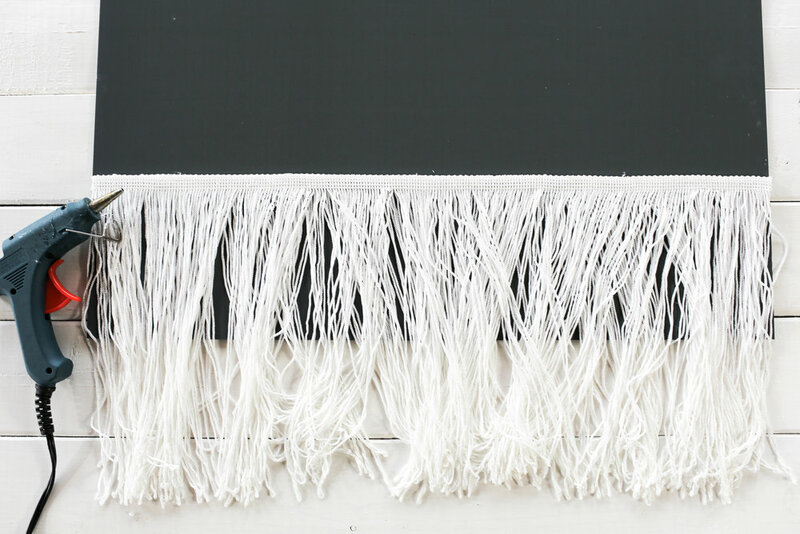 Next, we’re going to make this really cool dip-dyed looking wall tapestry. We are going to start by grabbing a metal floral ring. Grab some yarn and measure out double the width of the ring at its widest part, plus a little bit extra. Keep cutting these pieces until you have enough to cover the top half of the ring. Fold each piece in half, and tie it to the ring by pulling the ends of the string through the looped portion at the top. Repeat this until half of the ring is covered. Once you add enough, add a couple drops of super glue to each end of the row of yarn to hold the pieces in place. Time to give your yarn a haircut! Hang your tapestry and brush out all of your yarn under the ring. Next, use sharp scissors to cut the yarn around in the shape of the hoop. Next, time to add some fun colour! We started by diluting our paint colours of choice with some water. With a plastic sheet under your yarn, start by painting your colours onto your yarn. We went with this cool ombre effect. Feel free to let this dry and re-paint as needed! Time to make something that will perfectly fit any space you want to put it in! Grab a large canvas and 3-4 colours of your choice. 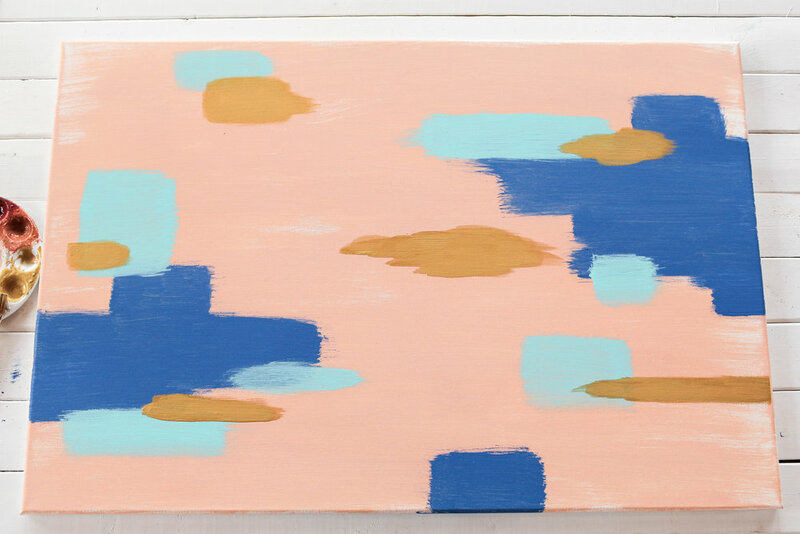 If you choose colours that are in your space, this art can be a great way to bring together a room! Start by coating your canvas in one of your colours. Use a wide and flat paint brush. Don’t worry about covering this canvas perfectly, we want to be able to see some white through and some brush strokes. Let this layer dry fully and move on to your next colour. Add some large blocks and lines wherever you’d like. Let this layer dry and repeat with another colour. Make your shapes slightly smaller this time. Let this fully dry and add a final layer! If you liked this post, check out the video below! If you make any of these, show us on instagram using the hashtag #sorrygirlssquad! As you may know if you watched our DIY Faux Brick Wall video, we decided to make this wall as a creative solution.